Aditus held a public hearing in Valletta this morning for two former bodyguards who allege that they were framed and tortured by mega-rich Kazakh exile Rakhat Aliyev, who is a resident of Malta. 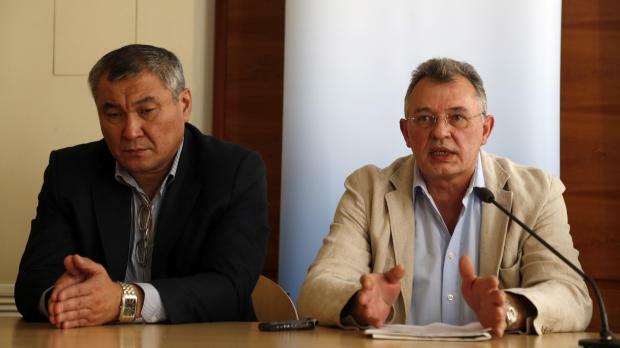 As a human rights NGO, Aditus said it felt compelled to provide the alleged victims – Satzhan Ibraev and Pytor Afanasenko –with a forum to present their case, as they had been repeatedly ignored by the Maltese police. Once a son-in-law to Kazakhstan’s President, Mr Aliyev is one of that country’s most wanted men. In 2007, he was sentenced in absentia to 40 years’ imprisonment for a number of crimes. This afternoon, he denied the two men's allegations (See his statement below) and said that the hearing was intended to put pressure and to misguide the Courts. Neil Falzon, director of Aditus, told the hearing that Mr Aliyev, who allegedly caused the former bodyguards severe bodily and psychological pain, has a clear and direct link with Malta through his permanent residence on the island. In terms of the Criminal Code, the Maltese authorities are duty bound to exercise criminal jurisdiction over the activities described by Mr Ibraev and Mr Afanasenko, Dr Falzon said. Torture is expressly forbidden without exception under several international and national legal instruments. The Maltese police and courts needed to establish whether torture did actually occur, who the perpetrator was and, if possible, bring the perpetrator to justice, the Dr Falzon, a human rights lawyer, added. The former bodyguards were arrested in 1997 for allegedly plotting a coup. They told the hearing this morning that Mr Aliyev was personally involved in their torture, and the claims about the coup have since been proven false. Asked by journalists what they wanted from the Maltese authorities, they replied through an interpreter: “justice”. Rozlana Taukina, an independent Kazakh reporter from the NGO Journalists in Danger, said she there was much evidence that showed the coup allegations against Mr Ibraev and Mr Afanasenko were completely fabricated. In a statement sent on his behalf by lawyer Joe Giglio, Mr Aliyev denied the allegations and reiterated his position that the two former bodyguards were, like himself and his family, victims of the Kazakh dictator Nursultan Nazarbayev. Mr Aliyev said his life and that of his family were in danger and that Kazakh secret service agents were in Malta to monitor his movements and possibly kill him and his family. He invited Aditus to listen to how he became a victim of the Kazakh dictatorship. He said a confidential court file has been leaked to the Kazakh Secret Service last July and renewed his appeal to the Police Commissioner to investigate this serious breach against Malta’s national security and the possibility that the Kazakh Secret Service infiltrated Malta’s highest security and justice systems. Mr Aliyev stated that the timing of today’s event coincided with the hearing of a court case scheduled for tomorrow in Malta. “Clearly, this event is intended to put pressure and to misguide the Courts of Malta on the eve of a court hearing and to position public perception in Malta against me and against my family,” he said. He questioned the use of Europe House as a venue for the meeting and asked the European Commission delegation in Malta whether it was aware that he would be the subject of strong character assassination attempts. (A disclaimer of any involvement by the EU was made by the organisers of the morning activity). “The European Commission delegation should explain why it has taken the side of a despicable dictator like Nazarbayev especially in view that several authoritative bodies and NGO’s have already declared that Kazakhstan is a dictatorship, a repressive state where people’s human rights are abused everyday, the Courts are not free and fair and the concept of free media is non-existent. “If the bodyguards want to present a civil claim in the Courts of Malta, I will have no problem to answer to their claim in court,” he said. However, Mr Aliyev said that the two bodyguards had already failed to turn up in a civil court hearing in Vienna to present their statements to the court. Their civil case in Vienna was thrown out and the Court ordered them to pay the legal expenses of the case.